Planning a wedding can be stressful, and with so much to do and prepare for, the last thing you want to think about is preparing the food yourself. 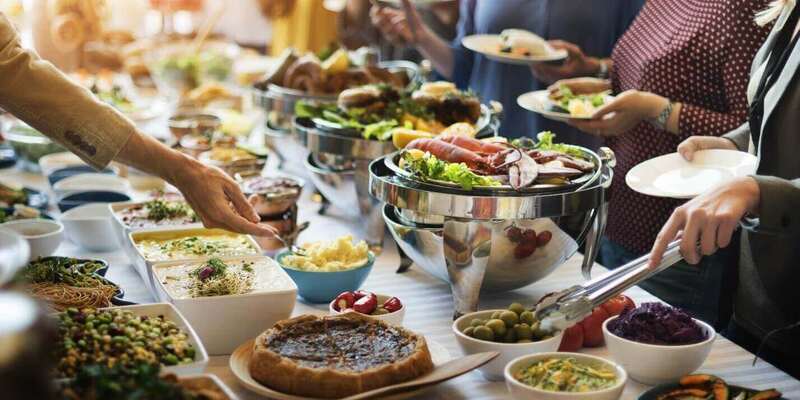 However, by doing your own buffet you can save literally thousands of pounds compared to hiring a professional catering company. We've put together some themed wedding buffet ideas that are easy, cheap, and most importantly will still impress your guests. They key to stepping up a buffet from children’s party to a wedding worthy spread is having a theme. Having a theme means you can make less food without the spread looking lacking, and it also offers the opportunity for some really creative presentation. Choosing a theme that is personal to yourself and your fiance, or that fits with the wedding itself, will impress your guests even more and make the food one of the features of the day, rather than something you obviously scrimped on. Do you and your fiance love Indian food? Perhaps you even have some Indian heritage and want to nod to that without a full Indian wedding. Indian food is great for a budget wedding because it’s so versatile, and can be really cheap to make especially when buying in bulk. Just remember that not everyone can tolerate spicy food so be sure to offer a mild option to prevent anyone going hungry. The best thing about Chinese food is it always goes further than you expect. If you love Chinese but are unsure about cooking it yourself, consider asking your local takeaway restaurant for a deal. Especially if you are a regular customer they might be happy to give you a very good price on a big bulk order. Mango Chutney and Lime relish – bought from supermarket but put into nicer jars to look home made. There’s nothing like home comforts! British food is instantly recognisable and there tends to be something for everyone available. Some small British flags around the table look great and make it immediately clear what the theme to the food is. Caribbean food is becoming increasingly popular in the UK because of it’s unique and diverse mix of flavours, but there’s still a lot of people who have never tried the cuisine. If you or your fiancé has Caribbean descent it makes perfect sense to cook up this cuisine, but even if you have just travelled there together, or just to a Caribbean restaurant in the UK, it’s sure to go down well with your guests. If you’re having a summer wedding then summer vegetables such as courgettes, carrots, green beans and broccoli will be in season, and therefore cheapest to buy! It makes sense then to use them in your meal to create a summer food theme. Similarly, if you’re having a winter wedding why not make the most of the cheapest in-season vegetables, such as parsnips, pumpkins, swedes and leeks? Chilly guests will be delighted by the winter warmers and the cosy, family feelings associated with winter food. If you have outdoor space at your reception then a barbeque is a great, cost effective option that everyone will be happy with. The best bit about a barbeque is how the smoke passes delicious smells all around the vicinity, getting your guests hungry and excited for the food. You don’t have to be outdoors to enjoy a great picnic themed buffet (although if you are – even better!). This theme is simple, familiar, summery and very British, not to mention a favourite amongst younger guests! If you and your partner are vegetarian, don’t feel pressured to provide meat for your guests, why not introduce them to some of your favourite vegetarian meals instead? Often vegetarian food is much cheaper to prepare as well, so this could be one of the most budget friendly themes. A rainbow buffet theme is as simple as choosing bold coloured foods and organising it in the order of the rainbow on the tables. You could choose just a couple of your favourite colours to use, or match the theme of the wedding, or go the whole hog and celebrate the full rainbow! AN UNSECURED LOAN FROM A FINANCIAL INSTITUTION IS NOT SECURED ON ANY ASSET. SINCE THERE IS NO COLLATERAL ATTACHED TO THIS TYPE OF LOAN, LOAN PROVIDERS MAY SEE YOU AS A HIGHER RISK.